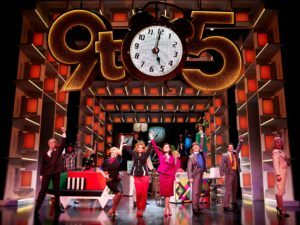 Huge success of 9 TO 5 THE MUSICAL at the Savoy Theater London! – Art, Food, Travel and Fashion! Huge success of 9 TO 5 THE MUSICAL at the Savoy Theater London! Following the huge success of 9 TO 5 THE MUSICAL at the Savoy Theatre in London’s West End, the producers of the show are delighted to announce that a second production of the hit musical will play 11 cities throughout the UK and Ireland, opening at the Alexandra Theatre Birmingham on 6 September 2019, before visiting Manchester, Milton Keynes, Liverpool, Glasgow, Woking, Aberdeen, Cardiff, Sunderland, Edinburgh and Dublin. 9 TO 5 THE MUSICAL tells the story of Doralee, Violet and Judy – three workmates pushed to boiling point by their sexist and egotistical boss. Concocting a plan to kidnap and turn the tables on their despicable supervisor, will the women manage to reform their office – or will events unravel when the CEO pays an unexpected visit? Inspired by the cult film this hilarious new West End production is about teaming up, standing up and taking care of business! 9 TO 5 THE MUSICAL tells the story of Doralee, Violet and Judy – three workmates pushed to boiling point by their sexist and egotistical boss. Concocting a plan to kidnap and turn the tables on their despicable supervisor, will the women manage to reform their office – or will events unravel when the CEO pays an unexpected visit? Inspired by the cult film this hilarious new West End production is about teaming up, standing up and taking care of business! 9 TO 5 THE MUSICAL is written by Patricia Resnick, with music and lyrics by Dolly Parton. It is directed by Jeff Calhoun, choreography by Lisa Stevens, design by Tom Rogers, lighting design by Howard Hudson, sound design by Poti Martin, video design by Nina Dunn, original arrangements by Stephen Oremus & Alex Lacamoire, original Broadway orchestrations by Bruce Coughlin, musical supervisor, reductions & extra arrangements by Mark Crossland, musical direction by Andrew Hilton and casting by Victoria Roe. Louise Redknapp re-joins the cast of 9 TO 5 THE MUSICAL in the role of ‘Violet Newstead’ at the Savoy Theatre, London from tonight, Monday 25 March until 29 June 2019. 9 TO 5 THE MUSICAL opened in the West End last month, where Dolly Parton attended the premiere and joined the cast on stage at the finale. The show is booking at the Savoy Theatre until 31 August 2019. Louise Redknapp most recently starred as ‘Sally Bowles’ in the national tour of “Cabaret”. In 2016 she reached the final of “Strictly Come Dancing”. As a musician Louise has sold millions of records. She was a member of the band Eternal before embarking on a highly successful solo career, with her first live shows in 15 years selling out all over the UK. Louise joins Amber Davies as ‘Judy Bernly’, Natalie McQueen as ‘Doralee Rhodes’, Bonnie Langford as ‘Roz Keith’ and Brian Conley as ‘Franklin Hart’. ← Decidedly French & Undeniably Caribbean Guadeloupe Island.